Frederick S. Kaplan, MD, explains how three Inglis residents paved the way for his life’s work and groundbreaking research, making a better life possible for those with a rare, catastrophic bone disorder. 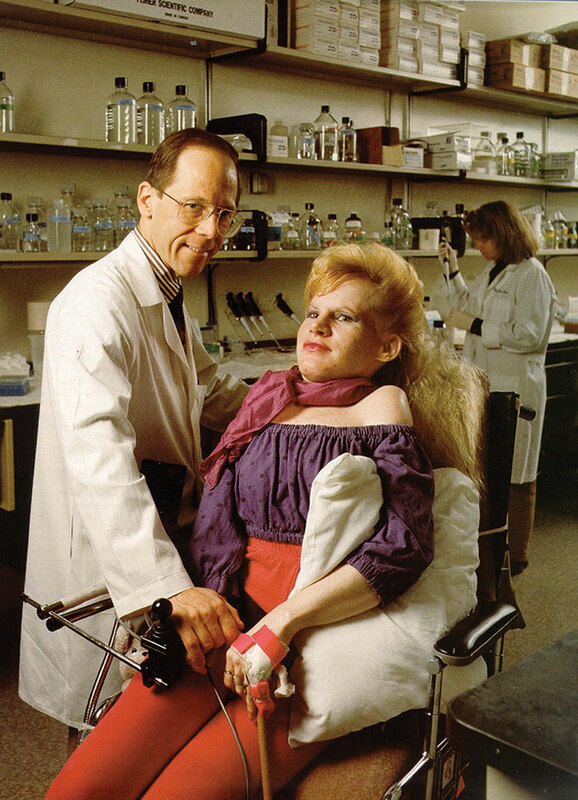 “Part one of my story begins in the mid-1980s when I was at the University of Pennsylvania with a special interest in metabolic bone disease. During a professional conference, I met then-Inglis Medical Director David Romanoff, MD. He was grappling with the care of two residents with Fibrodysplasia ossificans progressiva (FOP), an extremely rare bone disease that causes the abnormal development of bone in areas where it shouldn’t be, such as the ligaments, tendons and skeletal muscles. Dr. Romanoff asked me if I would see the two women, Ann Marie Falcone and Carol Orzel. Although I had read about FOP, I had never seen anyone living with it. Little did I know that seeing these Inglis House residents would foreshadow my life’s work. Meeting Anne Marie and Carol was a remarkable experience. Both were so engaged in life. When I met Carol, who still lives at Inglis House, I was amazed by her resilience in the face of severe disability. I could see the marked effects of FOP in her body and on her x-rays, which showed how an overgrowth of bone was locking up her joints. But her spirit and her joy in life were overwhelming. I wanted to help her. Two years later, I had another chance meeting…this time with Michael Zasloff, MD, at Children’s Hospital of Philadelphia. He introduced me to a child with FOP and my reaction was visceral and immediate. It changed my life. Carol and Anne Marie flashed through my mind, and I thought, “So this is how it starts.” I requested a three-year sabbatical to begin FOP research. In 1992, Carol was there to cut the ribbon at the official dedication of the University of Pennsylvania’s FOP Research Laboratory, that I established with my lifelong FOP research colleague, scientist and geneticist, Eileen M. Shore, PhD. Part two of my story takes place back at Inglis House. During one of my visits there, I was introduced to the sister of a former Inglis resident with FOP, Harry Eastlack. She told me about Harry and how he had bequeathed his body to medicine. It was initially part of the Temple University School of Medicine, but eventually, his skeleton was transferred to the Mutter Museum of The College of Physicians of Philadelphia. Every year, I would bring Penn medical students, post-doctoral fellows, research scientists and visiting professors to the Mutter Museum to see Harry’s skeleton, and every time, I saw something new to think about. Most of my major research questions started with Harry… and research is all about asking the right questions. I like to say that Harry bypassed the grave for an institution of higher learning. All we know about FOP today traces back to Harry. He left an incredible legacy. In 2006, Dr. Kaplan and his team identified the gene that causes FOP, sparking worldwide research efforts. Today, promising clinical trials are targeting at least four different approaches with the potential to prevent or treat FOP. Dr. Kaplan’s care of patients with FOP, which began with two residents at Inglis House, now includes 800 people on every continent. Dr. Kaplan is The Isaac & Rose Nassau Professor of Orthopaedic Molecular Medicine and Co-Director of The Center for Research in FOP and Related Disorders at the Perelman School of Medicine at The University of Pennsylvania. He is a member of The National Academy of Medicine.